Paris, France, between 1340 and 1350. Full orange levant morocco, inlaid in green, red, and black mosaic to an Italian design, with red levant doublures semis, with fleur-de-lis in gold, elaborate gilt gauffered edges by Lortic of Paris (19th century) in red morocco box case with 2 clasps. Purchased by J. Pierpont Morgan (1837-1913) in 1904. Owned ca. 1600 by Thomassin (name at bottom of folio 180); Monmerqué sale (Paris, 1851, no. 2804); A. Firmin-Didot sale (Paris, 1878, no. 33) to A. Fontaine (catalogue 1879, no. 513); Eugène Paillet Collection; Bull. Morgand 20 (1887), no. 12199; before 1888: collection of George Beach De Forest, New York; purchased by J. Pierpont Morgan (1837-1913) with remainder of De Forest collection in 1904; J.P. Morgan (1867-1943). Ms. written and illuminated in Paris, France, between 1340 and 1350; fol. 49, 106-113 (with spaces for illustrations), 130-137 and the codicile, fol. 179v-180, are written in a 15th century hand. 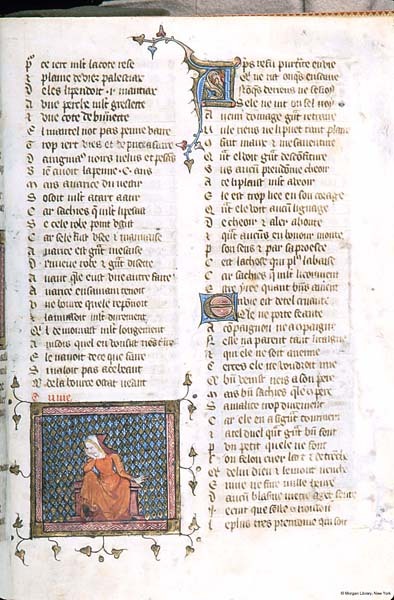 Texts: Roman de la Rose, begun by Guillaume de Lorris (fols. 1-149) and finished by Jean de Meun (fols. 150-179v). Codicile by Jean de Meun (fols. 179v-180). Decoration: 2 half-page miniatures and 31 small miniatures.